The proposed GND should apply to the entire world--to include countries with billions of people such as China and India. If not--if it is adopted as a domestic issue for the US only--then, the US will be shooting itself in the foot. Planes from China will continue to fly to US since there will be no US planes. It will be a unilateral disarm on the US part while the rest of the world will continue to move forward as they are today. Just my thoughts but what do I know. Paclands, I am asking the question because I would like to know how people coming to the US mainland are going to travel there. Those of us from Guam, CNMI, A. Samoa, Hawaii, Palau, FSM, Marshall Islands and all the other countries--can we fly to the US on China or other international airlines or something? Even if the US does not allow airplanes to land on the US airports under the GND, we can land in Mexico or Canada and then find out way to the US mainland. Or, maybe I am reading it wrong. While it is a US issue, we will certainly going to be impacted. Marc, you need to check more reputable sources for your information. The claim that flying will be banned is wacko right-wing bull crap. But oil burned flying from here to there is a tiny part of the problem. Plastics are made from refined petrochemicals, and the energy burned in refining the crude into petrochemicals for creation of products made partly or wholly from plastic is HUUUGE! Until humans can learn to live without plastic products, flying is safe. Except of course for the right-wing freak crowd. Thanks for the inquiry. As far as I know and understand, any airline can fly anywhere in the world if the destination country allows them to fly. How you get to your destination is your own issue. If you are saying that China Airlines can only go as far as Mexico, than you will need to drive from Mexico to the US and justify to boarder control why you didn't take a authorized flight into US. Oil-Gas-fossil fuel will be the world energy source for the next 100 years. Solor energy is in its infancy and hasn't reach the level to replace Fossil fuel. The GND talks about "zero-net" carbon emission has the goal in the next 50 years well that is not attainable even if they give it 100 years the GND won't achieve zero-net carbon emission. To do that travel by planes-cars-trains-boats must be eliminated. And most importantly lets not forget, the United Kingdom and Australian tried the Green minus the "New" deal and it failed in both countries and had to be stopped. The Democrats or socialists alt Left had their chance at a Senate vote on the GND and they didn't vote yes. Its gimmick. A socialists alt-left to get votes. And look at this, the cliamte warraiors all said by 2001 all the ice and glaciers in both north and south pole would disappear but low and behold them ice and glaciers are growing. Another micro topic hijacked by The Trump Troll. 1) eliminating all planes which could lead to the closing of the US-based international airports such as in New York, Los Angeles, etc. This is why Democratic Hawaii Senator said that it would be difficult for Hawaii. 3) reconstructing all the house and buildings in the US to make them more compatible to climate change issues. So I am asking if these ideas were only applicable to the US--and not applicable to China, India and the rest of the world--wouldn't that create problem to Americans and the US economy while the rest of the world continue to move forward in their own polluting ways? Instead of debating this issue we have Sarem blaming the failure of the GND on alt right (Trump) and i just pointed out the facts that the green deal failed in the U.K and Australia along with the fact that the goals of the GND will never be achieved. The GND claim it will create millions of jobs but its zero-net goal will destroy millions and millions of jobs along with stopping global trade. Somehow pointing out these facts is pro alt right and pro trump. red herring. Sarem Chuuk, please provide some links to what believe are "reputable source" of information regarding GND. It was reported that there was document released by the AOC's office about the GND. I am still trying to figure out whether this proposed GND is expected to apply only to the US as a domestic matter or would it also apply to the rest of the world including big polluters such as China and India. And what do you think would be the reaction from China, India and the rest of the world about the GND. Just asking. @marc AOCs team deleted their GND website that showed those reputable information when AOCs own GND website showed that cow farts and plane travel elimination were part of the GND-Zero-net carbon emission plan. Its not a alt right conspiracy or Trump troll conspiracy when AOCs own staff deleted their own website regarding reputable Information from the Green N Deal. $93trillion dollars is the ultimate price of The GND. The U.S. can only make policies and laws - like the proposed Green New Deal - for itself, not for other independent countries. They make their own laws. There is a similar proposal in Australia called the Green Plan. The Green Deal or Plan or GND werr implemented in U.K And Australia and failed to show progress and meet its goal in both countries. And Democrats didn't vote on their GND last week. They didn't vote yes. its all a vote getting scheme. I don't believe its a alt right conspiracy that AOCs GND talks about cow poop or want to eliminate it as part of her GND. Here is a video which she admits that cow poop contribute methane to atmosphere and we must feed cows different fodders to make cow poop have less methane. Shut your mouths leftists!...you're emitting green house gas needlessly! Conservatives, please continue to speak because you don't believe in the climate change religion or in pope Al Gor or priestess AOC. This new religion ushers in socialism in the name of imminent climate change damnation....Amen? 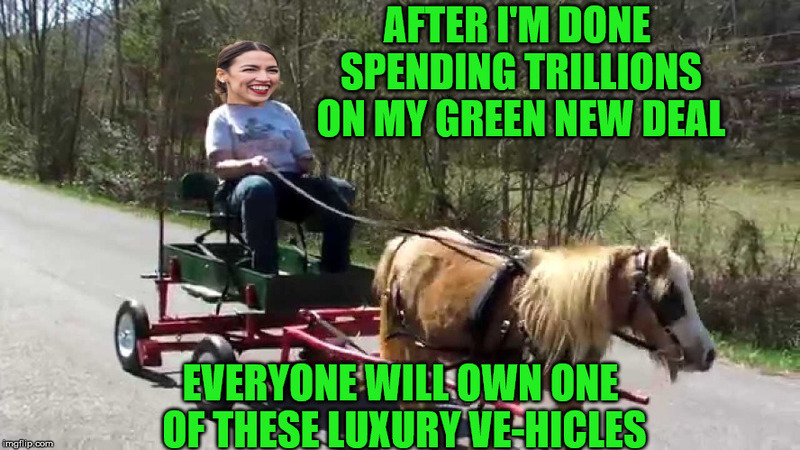 On Thursday night, comedy duo Desus Nice and The Kid Mero asked Ocasio-Cortez why she thought the initial reaction to the Green New Deal focused on bovine exhaust. “In the deal, what we talk about, and it’s true, is that we need to take a look at factory farming, you know? Period. It’s wild,” Ocasio-Cortez said. The Democratic socialist also defended her call for a 70 percent marginal tax rate on incomes over $10 million. Reaper, thanks for the additional information. I was wondering if the US were to implement the proposed GND as it, what about the rest of the world? From all the discussions in here as well as in TV and other US media, this GND as proposed by her and Sen. Markley is for US only. What about trying to get China, India and all the rest of the world to agree to the GND? They are more polluters than the US. It's like saying let's cripple ourselves or kill our nation and our petroleum-based industries--but the rest of the world can continue on doing the same things that they are doing now. If some of these GND extreme measures are adopted, the US' aviation industry will collapse. Other industries will also collapse. The US then will turn to China and other countries to provide airplane services; and import food from these other countries. Yes, the problem of climate change and carbon emissions should be addressed. But they can addressed with new sciences and technology such as the "fracking" for oil production which the US is already doing. Wind for turbine, solar panels, battery-operated vehicles and other technologies have been developed and will continue to be improved; and can contribute to the reduction of climate change problems. But there is no need to sacrifice oneself so others, like China, India and the rest of the world--can live. As i pointed out earlier Patroleum or fossil fuel won't be replaced as the main energy source for the next 100 years. The GND is achievable and won't be taken seriously cuz as said it will make the US vulnerable in trade, defense and damage the US economy. Totally not true and misinformed.. I would be surprise who is talking now. visafree, please explain what you mean by "Totally not true and misinformed". It would help with the discussion; and your view could be understood better. @ marc, what I mean is that your information are not any where near the CND proposal, this proposal is all about saving the planet from climate change effects and at the same time create more higher paying job for all , this is also address the issue of economic in equality among the citizen of the country, in regard to you concern about the rest of the world, like I said the center of this proposal is for all regardless of who you are what country it is, everyo9ne will benefit the entire planet will benefit..
Notice how visafree's views conflict with AOC's green new deal? Former president Barry describes this type of progressive controversy as "circular firing squad." Z is that you again my friend? good to see you still around and kicking.. btw, can you please explain what do you mean by " circular firing squad" ? it sure is good to hear new terms of speaking my friend. Ask Barry what it means. GND's proponents are talking about 12 years for the world before its demise. Actually, it's 11 years and 8 months according to the GND. But that is wrong; there is no basis for 12 years projection. The 12 years was presumed because 2030 was the target for all countries to achieve their emission compliance under the Paris Accord. Nothing to do with the earth coming apart. It is reported that a similar type of document and scenerios were projected by a UN document back in 1989: similar scary projections. But since 1989, hundreds of millions in China and Africa have moved out from extreme poverty. China, India and South Korea have become economic powerhouse. The Soviet Union has collapsed and Internet was born. So don't worry about the world coming apart in 12 years. There is no unanimity among scientists about this particular time scenario. But I think GND is being pushed and justified by the 12 year urgency scare--so that other agendas such as government taking over everything will be more acceptable. Just some thoughts. my understanding is that the time frame is what the world scientist have predicted that the issues of climate change is irreversible and not the time the world is demise, after the time frame there is nothing anyone can do that's why today this is the issue of great concern around the world. It is a false religion. Do not listen to these ecological hypocrites else you too may become a socialist (communist) or worse... a self-righteous ecofeminist.